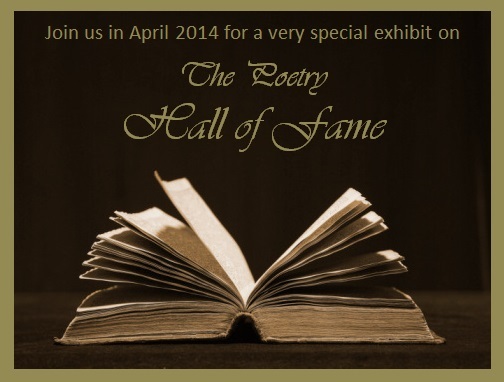 Throughout the month of April, the Emmett Lee Dickinson Museum (located above the coin-op Laundromat on Dickinson Boulevard in Washerst, PA) will feature a very special exhibit on the Poetry Hall of Fame. 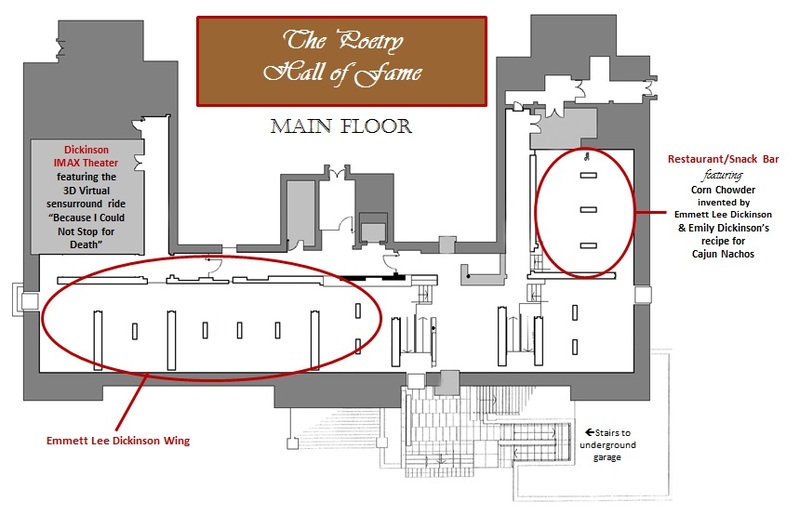 The Poetry Hall of Fame, also located in the heart of historic Washerst, includes an entire wing dedicated to Emmett Lee Dickinson (Emily Dickinson's third cousin, twice removed -- at her request). However, it also has exhibits to Hall of Famers Wink Whitman (Walt Whitman's brother), Bytha Pound (Ezra's brother), Jack Kilmer (Joyce's sister), and many more world-famous poets. Be sure to check back throughout the month for more on this very special exhibit! 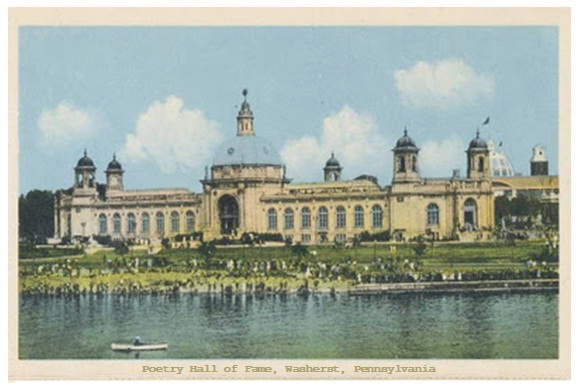 The Poetry Hall of Fame is the fifth most popular tourist attraction in Washerst just after the Emmett Lee Dickinson Museum (above the coin-op Laundromat on Dickinson Boulevard), DickinsonLand (info HERE), the Celebrity Look-Alike Wax Museum and Hall of Fame, and the Washerst Mattress Dump (the fifth largest mattress dump in the United States -- behind those in Memphis, Tennessee; Chattanooga, Tennessee; Knoxville, Tennessee; and Ithaca, New York). Pictured at the right: The Poetry Hall of Fame. Click the image to enlarge. Of course, the top attraction at the Poetry Hall of Fame is the Emmett Lee Dickinson wing on the main floor. 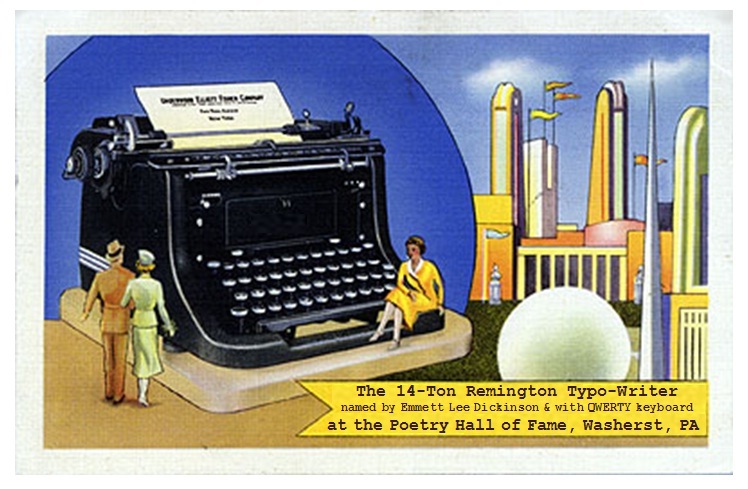 Other attractions are the Dickinson IMAX Theater (featuring the 3D virtual sensurround ride "Because I Could Not Stop for Death"), the restaurant featuring corn chowder (invented by Emmett Lee Dickinson) and Cajun nachos (invented by Emily Dickinson), and the 14-ton Remington "Typo-Writer" (pictured below on the right). 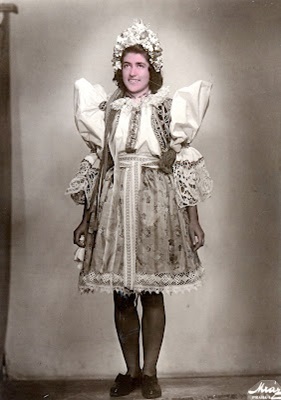 Pictured above: The only known likeness of Emmett Lee Dickinson (Emily Dickinson's third cousin, twice removed -- at her request). 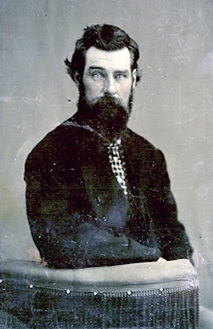 Walt Whitman always said that it was his brother Wink who inspired him to become a poet -- and Wink Whitman said that it was Emmett Lee Dickinson (Emily Dickinson's third cousin, twice removed -- at her request) who inspired him. Published in 1853, Wink Whitman's collection of poetry Mows the Grass is widely recognized as a seminal work in American poetry. Its genesis is from a poem by Emmett Lee Dickinson which begins, "If all the grass I am to cut / Would only grow today." Pictured at the right: A first edition of Wink Whitman's Mows the Grass -- which inspired his brother Walt Whitman to write Leaves of Grass. Tweeting with hashtags their strong sanctimonious tweets. Pictured at the left: Walt Whitman leaves Camden, NJ, on a journey of self-discovery. 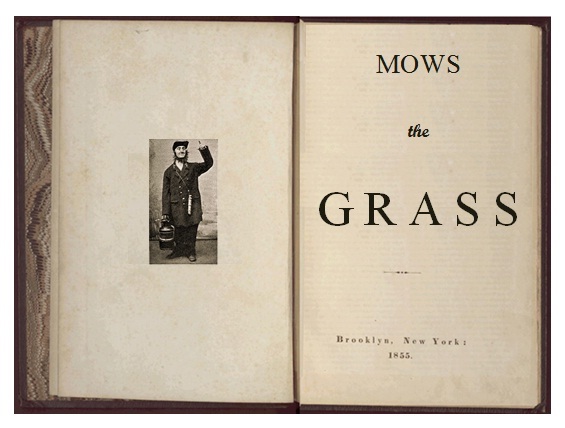 Whitman said that his brother Wink's book Mows the Grass affected him so much that he had to "walk the rails to re-examine all that I had been told and to dismiss that which insulted my soul." The end result of his journey was Leaves of Grass. He credited his brother's work for allowing him to create his own. Like Walt Whitman, Robert Frost credits his brother Jack for inspiring his poetry. Unlike the punctilious and proper Robert, though, Jack Frost was more free-thinking and independent. The founder of what has become the modern-day "hipster" movement, Jack Frost has also had a lasting influence on hip hop, gangsta rap, and performance poetry. But she got the a/c on full blast and I’m effin cold. Tho what woman’s as hot as she think herself? End up far better than expected. Holla! Either way, she gone be dangerous. 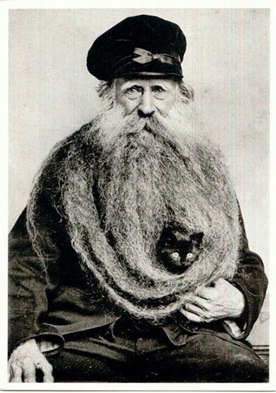 founder of the modern-day hipster movement. Pictured below: Two rooms from Jack Frost's apartment. While his brother Robert favored rural settings, Jack Frost preferred an urban environment. Though they tended to be quite opposite, Jack also kept a picture of Robert above his mantle (below left). 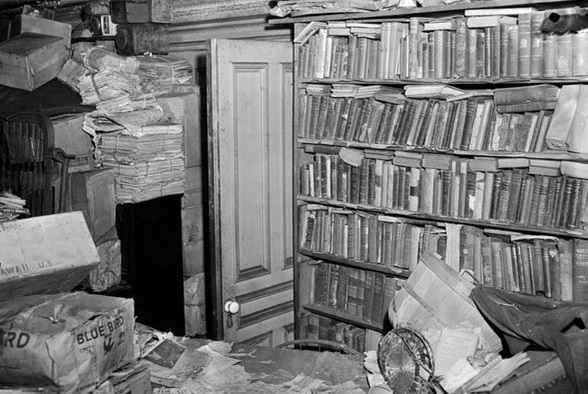 Jack also had a collection of over 25,000 books in his library (below right). Sangsom Blues was one of the most influential voices in the period that has become known as the Harlem Middle Ages, the years just before the Harlem Renaissance. He often recited his poetry at the Harlem landmark, the Linen Club, He was also the poet whom Langston Hughes credits for inspiring his work. What happens to a scream unheard? like it’s racing to the sun? Does it shrink like shriveled feet? Below left: Another classic poem by Sangsom Blues. Below right: A poem by Langston Hughes which derived from Sangsom Blues' poem. Grown old is the humor of Joan Rivers. 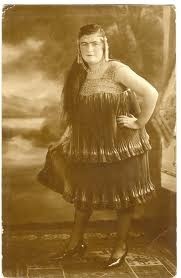 She got her start on Carson when dawns were young. She served a stint as the Guest Host – and lulled me to sleep. bosom tanned all golden in the sunset. 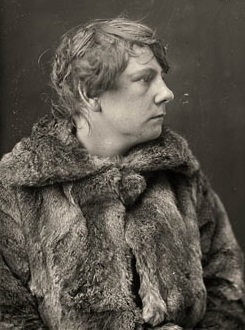 Uhmilli Dikeanssöhn, Sweden's preeminent poet, was a distant relative of Emmett Lee Dickinson and Emily Dickinson. She was the great-great-great-great-great-great granddaughter of Edvin Gunnbjörg Dikeanssöhn, a whittler and palingwright (a maker of wooden fencing). A contemporary branch of the Dikeanssöhn family owns and operates IKEA, the home furnishings company that designs and sells ready-to-assemble furniture (originally out of fencing slats). 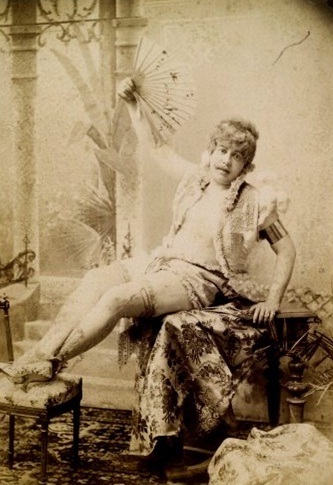 For more information on Uhmilli Dikeanssöhn, her poetry, and her connections to the Dickinsons and IKEA, click HERE. 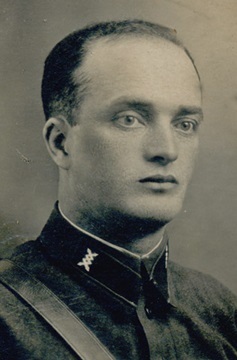 Pictured above: Hujik Dikeanssöhn. For more information on Hujik Dikeanssöhn and the Swedish tradition of the Pøesie Shmâcka, click HERE. 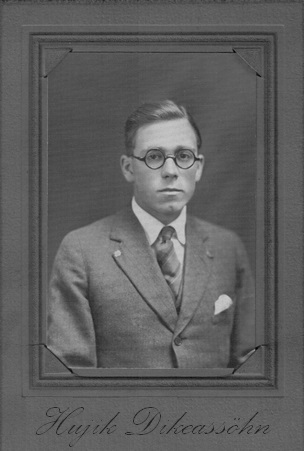 Another Swede in the Poetry Hall of Fame is Uhmilli Dikeanssöhn's son Hujik Dikeanssöhn. He is the one who started the Swedish tradition of the "Pøesie Shmâcka," which translates into English as "Poetry Slam." Around the world, Hujik Dikeanssöhn is known as the Father of the Poetry Slam. Pictured below: ListVerse listed the Pøesie Shmâcka as the fifth most awesome thing about Sweden. Rules and regulations for Poetry Slams in Sweden are set and monitored by the Swedish National Pøesie Shmâcka Appraisal Board. Pictured at the left: The founding members of the Swedish National Pøesie Shmâcka Appraisal Board. 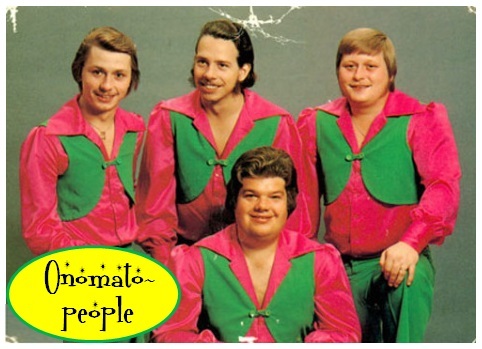 "OnomatoPeople" is the group credited with introducing beat-boxing to the world. 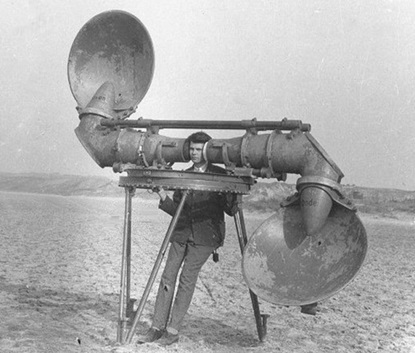 "Where'Dya Meter" won with a daring and innovative work of over 20,000 haikus that retold the story of The Gulag Archipelago by Aleksandr Solzhenitsyn. Ezra Pound made it known emphatically that were it not for his brother Bytha Pound, he would have not tried his hand at poetry. 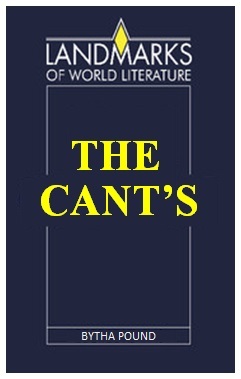 Bytha Pound's critically acclaimed tome The Can'ts led Ezra Pound to write his 120-section, incomplete poem The Cantos. 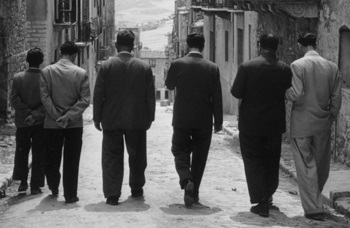 Their mother, Haffa Pound, claimed that sibling rivalry is what really led the brothers to write their the two lengthy poems. "No matter the subject," she reported, "each would make wild claims about their skills and abilities, and then the arguing would start. 'No you can't.' 'Can too.' 'Cannot.' 'Can too.' I swear," Haffa Pound claimed, "their constant argument is even apparent in the name of their poems." 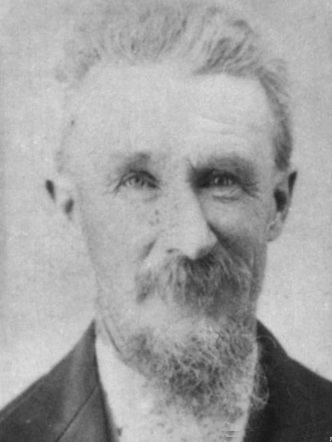 Bytha Pound, brother and rival to Ezra Pound. 1. 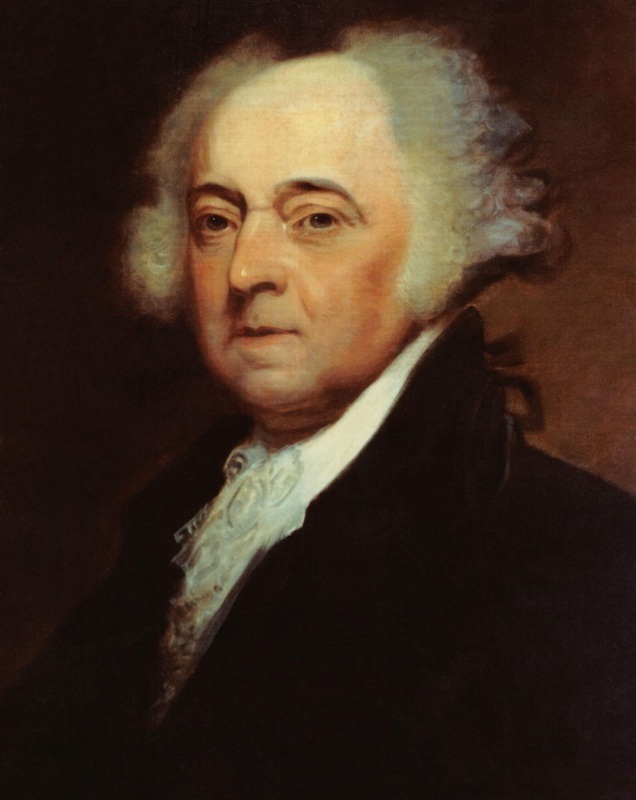 In Canto LXII, Ezra Pound wrote of John Adams. 2. 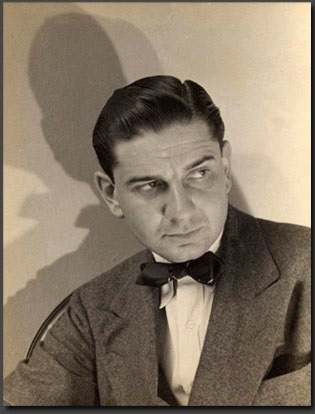 Not to be outdone, Bytha Pound wrote about cartoonist Charles Addams in Can't LXIII. 3. Ezra followed with Canto LXIV focusing on Edie Adams. 4. 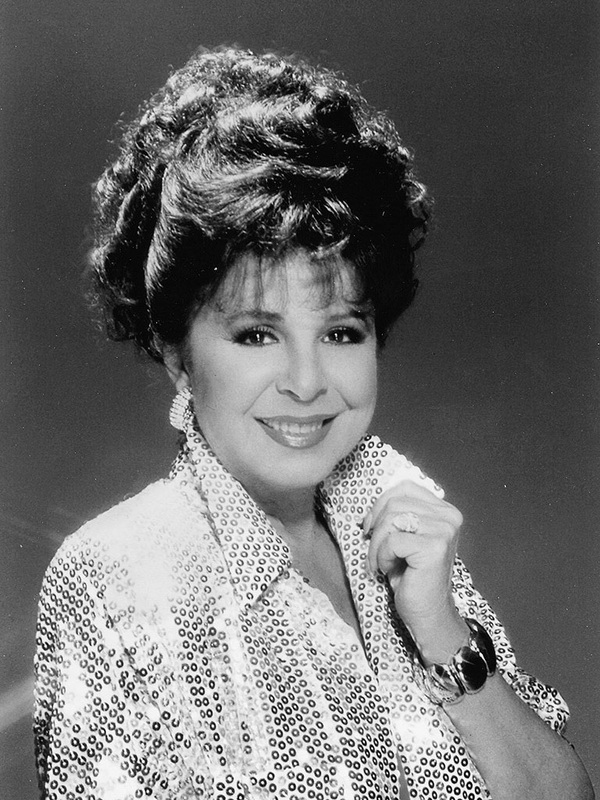 Then, in Can't LXV, Bytha wrote about singer Edie Gorme. 5. Trying to top that, Ezra focused on Graham Kerr, the Galloping Gourmet, in Canto LXVI. 6. 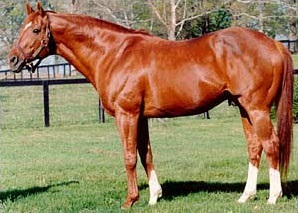 After that, Bytha Pound, in Can't LXVII, wrote about Secretariat. Not to be topped by his brother, Ezra Pound rode Secretariat in all three races to win the Triple Crown. Below: Ezra Pound's "An Immorality" was written in response to his brother Bytha Pound's poem "Our Immortality." Naught else is worth the tweeting. There is naught else worth repeating. And I would rather have my tweet. And doubt my friends are reading. 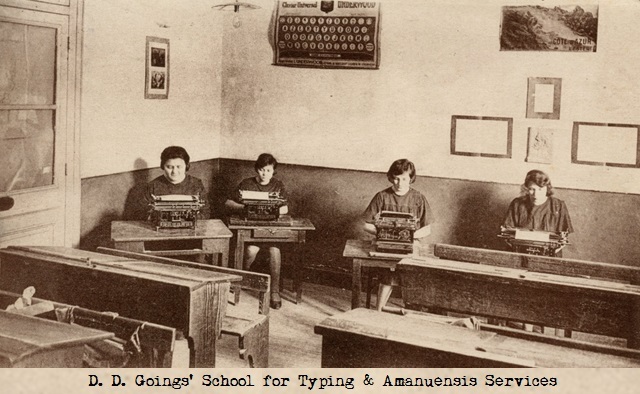 Daisy Delphi "D. D." Goings (pictured at the left) was one of the first to see the creative capabilities of the typewriter, and her works inspired E. E. Cummings to experiment with form and the arrangement of his poetry. In the late 1800s, D. D. Goings opened her School for Typing and Amanuensis Services in Washerst, PA.
T. S. Eliot became a poet, he said, due to the influence of his second cousin X. L. Eliot (pictured at the right). 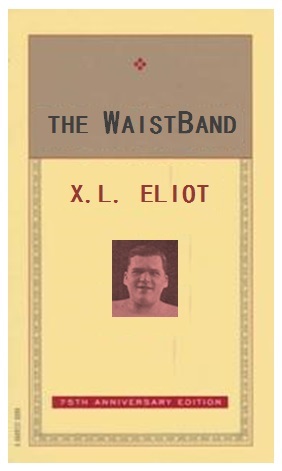 X. L. Eliot was a leading poet in the Food Poetry Movement at the turn of the 19th and 20th centuries. 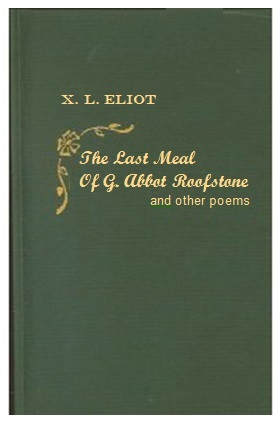 Another of X. L. Eliot's seminal works is "The Last Meal of G. Abbot Roofstone" which inspired T. S. Eliot's "The Lovesong of J. Alfred Prufrock." And lead us to an overwhelming question…. 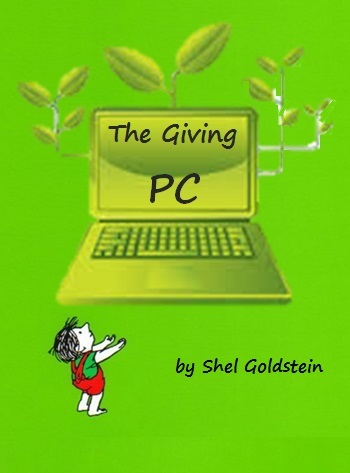 Shel Goldstein was an American poet, singer-songwriter, cartoonist, screenwriter, and author of children's books. He is also the person who most influenced poet Shelbert Allan Silver who -- to honor Goldstien -- changed his name to Shel Silverstein. Goldstein is known as the Father of Internet Poetry, as many of his poems focus on the theme of surfing the Internet. Pictured below: Two of Goldstein's most popular books are Where The Firewall Ends and The Giving PC. 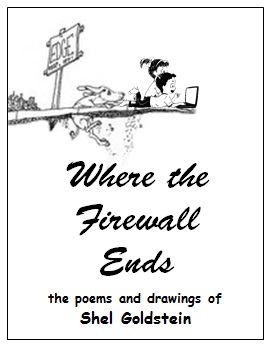 Below: The poem at the right, "There is a place where the firewall ends," is the title poem of Shel Goldstein's book Where the Firewall Ends. The poem inspired Shel Silverstein to write "Where the Sidewalk Ends" (on the left). in a place where the firewall ends. the place where the firewall ends. Below: Shel Goldstein's poem about Timmy Tett (on the left) inspired Shel Silverstein to write a simiar poem about a boy named Jimmy Jet (on the right). 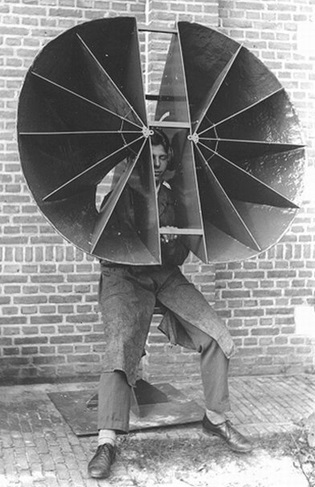 And speakers grew from his knees. Grew where his eyes had been. We sit around and use him. One of the most powerful voices in the area of fashion poetry is Jack Kilmer, the sister to Joyce Kilmer. 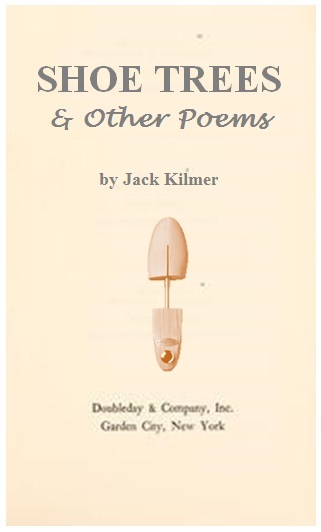 With the publication of "Shoe Trees" in the magazine Poetry in August 1911, Jack Kilmer gained immense popularity as a poet across the United States -- and her success inspired her brother Joyce to become a poet. Pictured at the right: Shoe Trees & Other Poems by Jack Kilmer. Pictured at the far right: Jack Kilmer, Joyce Kilmer's sister. Pictured below: Jack Kilmer's poem "Shoe Trees" (on the right) rocketed her to fame, and it inspired Joyce Kilmer to write "Trees" (on the left). A poem lovely as a shoe tree. But none as lovely as a shoe tree. 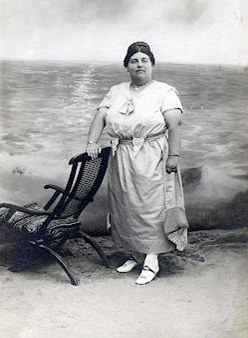 Wilhelmina Blake, another prominent voice in the Food Poetry Movement, was the Great Aunt -- and the greatest inspiration -- to poet William Blake. Largely unrecognised during her lifetime, Blake is now considered a seminal figure in the history of the poetry and visual arts of the Food Poetry Movement. 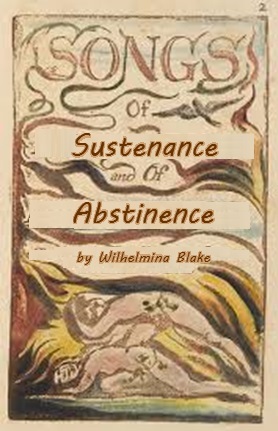 Songs of Sustenance and of Abstinence is an illustrated collection of poems by the poet herself. It appeared in two phases. A few first copies were printed and illuminated by Wilhelmina Blake herself in 1787; three years later she bound these poems with a set of new poems of feasting and dieting. Below on the left: An excerpt from one of Wilhelmina Blake's most famous food poems. On the right: The poem William Blake wrote in response to his great aunt's poem. Little lamb, Who baked thee? Dost thou know who baked thee? With the glaze o’er your meat? Served with savory wild rice? Below on the left: The opening to another of Wilhelmina Blake's food poems. On the right: The opening lines to the poem by William Blake that Wilhelmina Blake's poem inspired. Could fry thy divine piquancy? 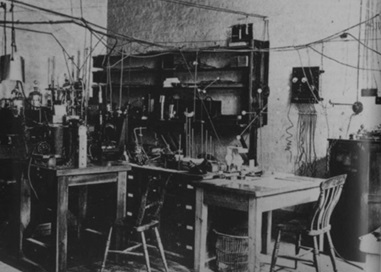 In 1730 Servington Savery rocked the world of magnetism and electricity when he produced the first compound magnet by binding together a number of artificial magnets with a common pole piece at each end. Two centuries later, his great-great-great-great-great-grandson, Sedgewick Savery III, rocked the world of poetry when he invented magnetic poetry. 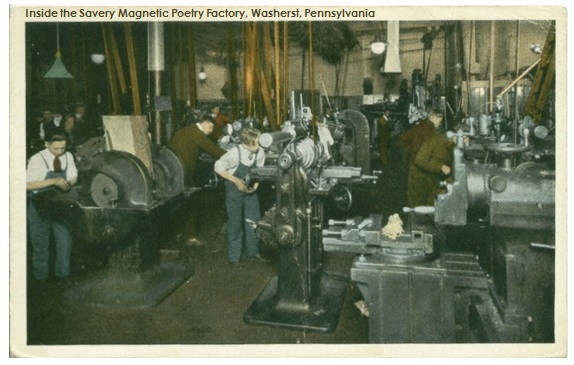 Pictured below left: Inside the Savery Magetic Poetry Factory in Washerst, PA, where skilled poets create magnetic words to include in magnetic poetry kits. 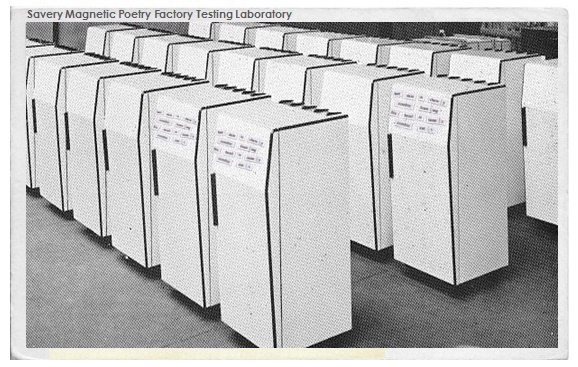 Pictured below right: Thousands of refrigerators line the floor of the Savery Magnetic Poetry Factory's Testing Laboratory. No magnetic poetry kits is assembled or sold unless it has been tested by several of the company's trained and certified magnetic poetry kit poets. Sedgewick Savery III, who in 1980 rocked the world of poetry when he invented magnetic poetry kits. The top ten most requested words in magnetic poetry kits. 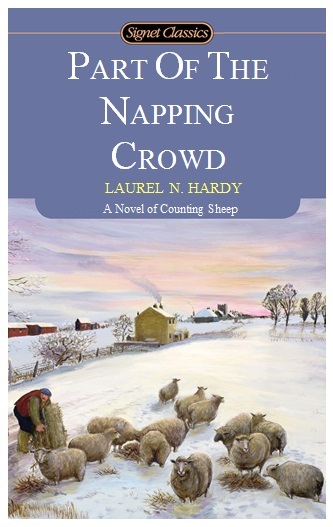 Laurel N. Hardy, Thomas Hardy's first cousin and his greatest influence, was an English novelist and poet. A Victorian realist in the tradition of George Eliot, he was influenced both in his novels and in his poetry by a specific branch of Romanticism called Somnambulism. Pictured at the left: Laurel N. Hardy, Thomas Hardy's first cousin. 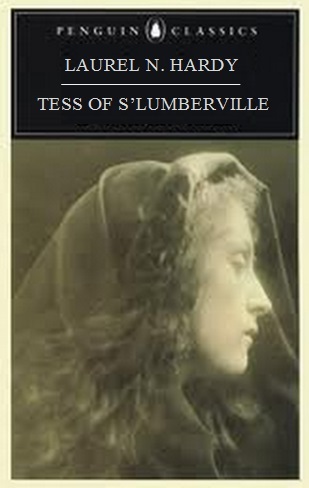 Pictured at the right: Two of Hardy's classic novels in somnambulist literature: Part of the Napping Crowd and Tess of S'Lumberville. Click the images to enlarge. Had called and meted sleep deservedly. And why undreams the best trance ever dreamed? And craving Time for slumber I am numb. . . . Holds up my sleep and reverie once more. 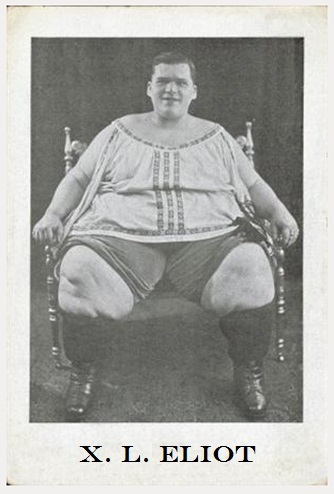 In addition to Laurel N. Hardy (above), another important voice in the somnambulist movement in poetry was Maya Devilou. Devilou published several autobiographies, three books of essays, many plays, and various books of poetry over the span of more than fifty years. 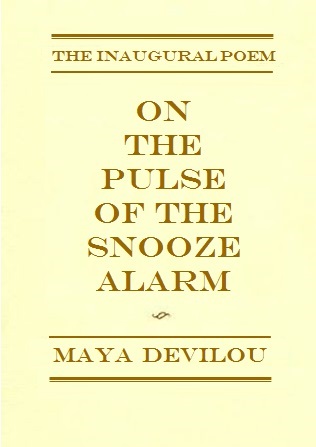 American poet Maya Angelou credited the work of Devilou with steering her to try her hand at poetry. 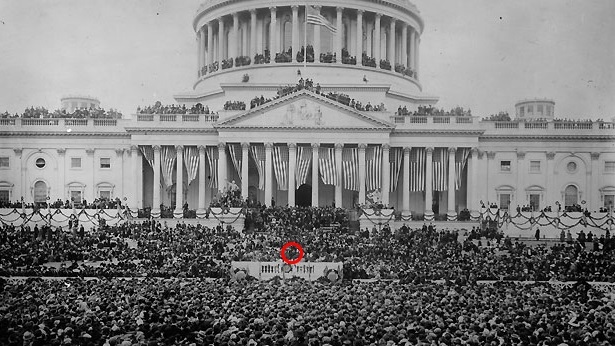 Pictured at the left: Devilou wrote and read the inaugural poem, "On the Pulse of the Snooze Alarm," for the inauguration of William Howard Taft. 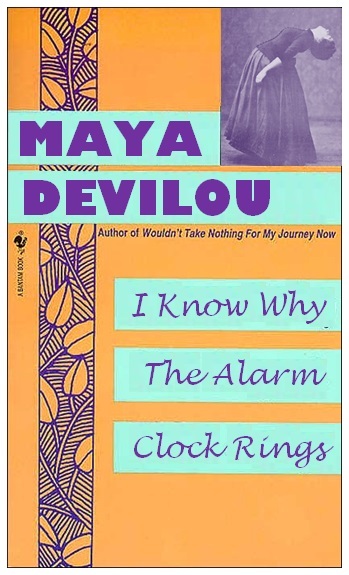 Pictured at the right: The first of several autobiographies written by Maya Devilou, I Know Why The Alarm Clock Rings. Pictured at the far right: Devilou's inaugural poem for the 27th President of the United States, "On the Pulse of the Snooze Alarm." But still, like dogs, I’ll snooze. Does my sleepiness upset you? Why are you upset with me? Late last night on my TV. 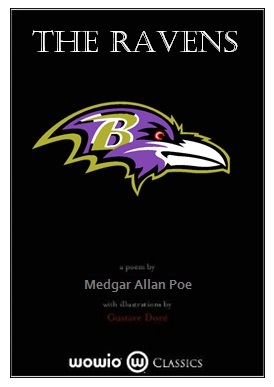 Medgar Allan Poe was an American author, poet, editor, and literary critic, considered part of the American Sports Poetry Movement. 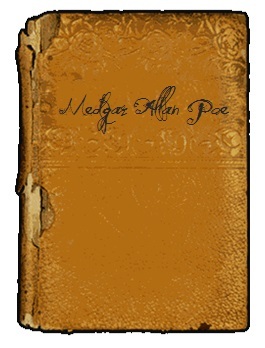 He was the second cousin of Edgar Allan Poe who said that Medgar's poetry was what inspired him to start writing. 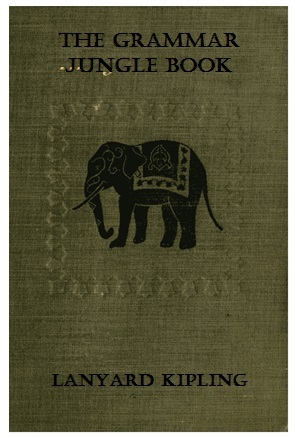 Lanyard Kipling was an English short-story writer, poet, and novelist. He is chiefly remembered for his tales and poems about grammar and the English language. 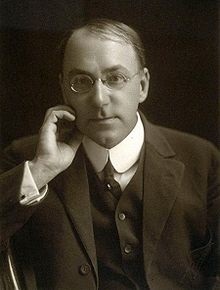 He was the older brother of Rudyard Kipling. 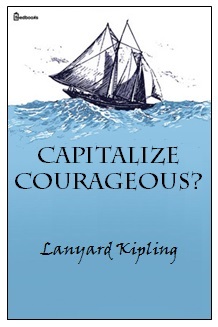 Below: Some of the classic stories of grammar and mechanics by Lanyard Kipling. 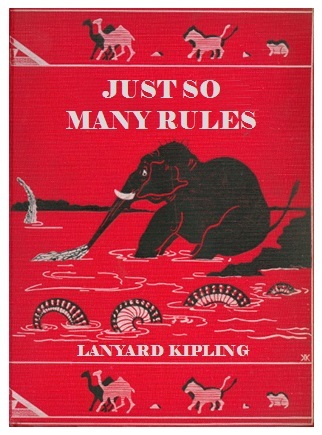 One of Lanyard Kipling's greatest pet peeves was when someone would say "should OF" instead of "should HAVE." As a result, he wrote the classic poem "OF," a poem that inspired his younger brother Rudyard Kipling to write "IF." Below: The first and final stanzas of Lanyard Kipling's "OF" on the left, and Rudyard Kipling's "IF" on the right. And – even more – you’ll be a Grammarian, my son! 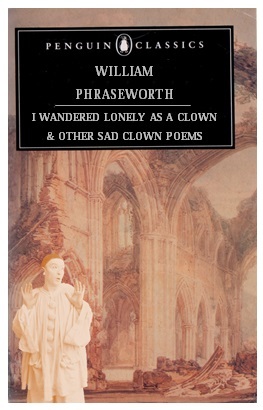 William Phraseworth was a major English Romantic poet who, with Samuel Coleridge Taylor, helped to launch the Happy Clown/Sad Clown Movement in English literature with the 1789 joint publication Comical Ballads. 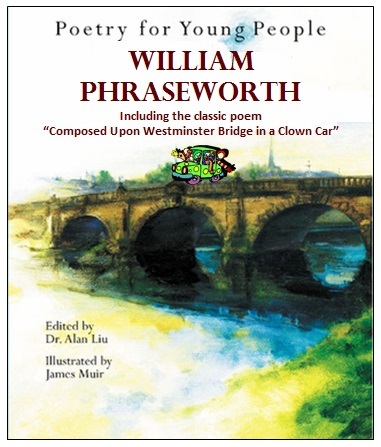 The work of Phraseworth also inspired William Wordsworth to become a writer and poet. Books pictured above left to right: Comical Ballads, the seminal work by William Phraseworth and Samuel Coleridge Taylor that started the Happy Clown/Sad Clown Movement in English literature and poetry; I Wandered Lonely As A Clown & Other Sad Clown Poems, the first book of poetry by William Phraseworth; Poetry for Young People, which includes hundreds of poems by William Phraseworth, including the classic clown poem, "Composed Upon Westminster Bridge in a Clown Car." Click the images to enlarge. Below left: The opening lines to William Phraseworth's classic sad clown poem "I wandered lonely as a clown." 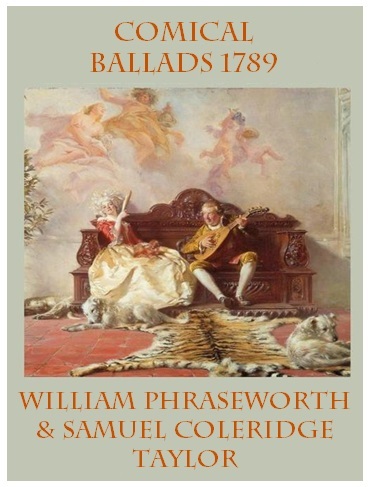 Below right: Phraseworth's poem inspired William Wordsworth to write "I wandered lonely as a cloud." Sputtering with seltzer in my pants. Idonia Elinor Ettie Alcester Zylphia Cantwel Whooperswan Hyperbole (pictured at the left at age 24 and pictured at the right at age 36) attended Oxford University, and she later worked for Oxford University Press. As an editor at OUP, she was the first to introduce the placement of highly exaggerated and extravagant reviews printed on book covers and book flaps. 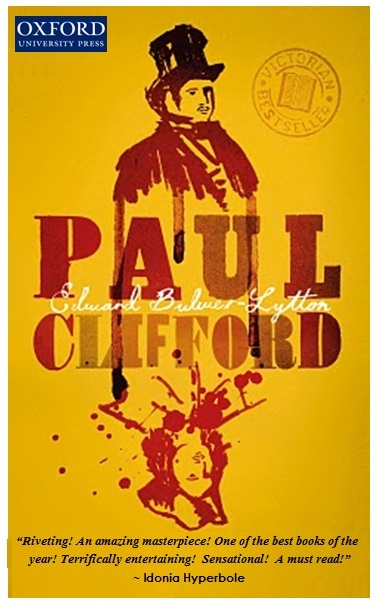 Pictured below on the right: The book that started it all: Idonia Hyperbole put her review on the front cover of Edward Bulwer-Lytton's novel Paul Clifford. Right from the novel's opening line, "It was a dark and stormy night," Idonia Hyperbole could not put the book down. She wrote about the book, "Riveting! An amazing masterpiece! One of the best books of the year! Terrifically entertaining! Sensational! A must read!" Due to the exaggerated nature of her reviews, overstatement in literature and poetry has come to be known by Idonia's last name, "Hyperbole." 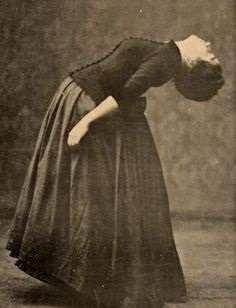 Pictured below: Idonia Hyperbole was a great fan of the poetry of Emmett Lee Dickinson (Emily Dickinson's third cousin, twice removed -- at her request). In her later years, she moved to Washerst to study his life and poetry. Her estate (shown below) is the most visited private home in America. 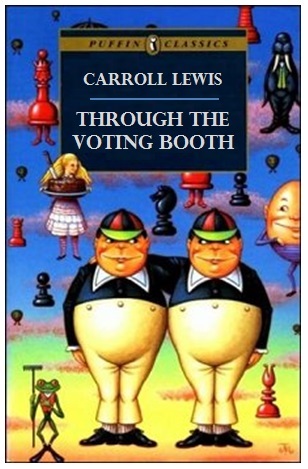 Carroll Lewis was an American mathematician and logician who also wrote political satire. 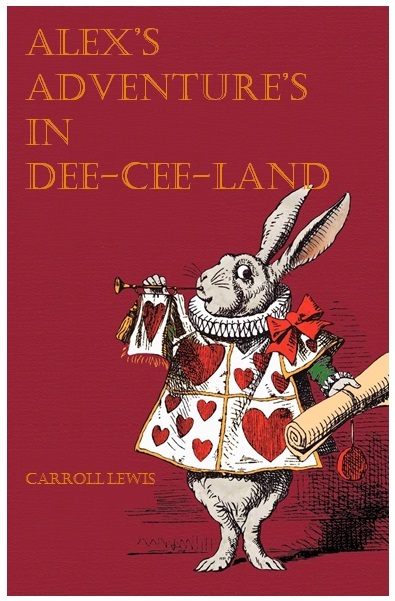 His political parodies and nonsense poems inspired British mathematician Charles Lutwidge Dodgson to adopt the pen name "Lewis Carroll" and to write nonsense poems and stories. 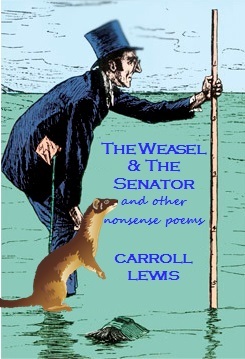 Pictured below: Three of Carroll Lewis' classic books and poems: Alex's Adventures in Dee-Cee-Land; Through the Voting Booth; and "The Weasel & the Senator," about two conniving characters in search of some ill-gotten clams. “Beware the Politalk, my son! The words that sleight, the jaws that yap! And brabbled with a smile! The skeptic foil went flicker-flack! He thought he’d slain the Politalk! “O crapful day! Forsooth! Forsay! Many people have heard of "cowboy poetry," but have you heard of "butcher poetry"? After those legendary cattle drives where the cowboys would move their herds to the meat market, the butchers would take over the work, and that was where "butcher poetry" got it's start. 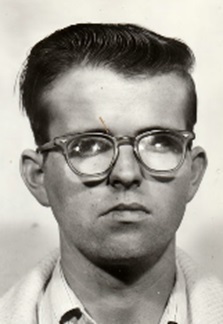 One of the leading voices in "butcher poetry" was Carl Iceberg. Often referred as "the hog butcher for the world," Iceburg was a great inspiration to poet Carl Sandburg, who once honored him by alluding to his nickname in the opening line of one of his poems. 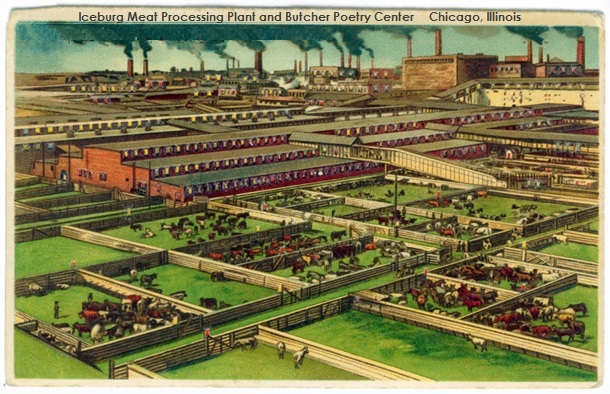 Pictured below: The state-of-the-art meat processing plant and Butcher Poetry Center is named for America's greatest Butcher Poet, Carl Iceburg. Below: One of Carl Iceburg's most famous poems (on the left), and the poem by Carl Sandburg that it inspired (on the right). for us to dine on. 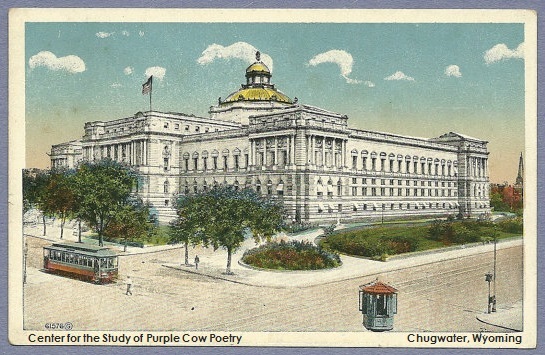 Gelett Burgess changed the world of poetry forever when he published his "purple cow" poem , and his later feud with Emmett Lee Dickinson (Emily Dickinson's third cousin, twice removed -- at her request) turned out to be just as legendary. In July 2013, the Emmett Lee Dickinson Museum (above the coin-op Laundromat on Dickinson Boulevard) sponsored a special exhibit on Burgess, purple cow poetry, and the Burgess-Dickinson feud. For information on that exhibit, click ﻿HERE﻿. 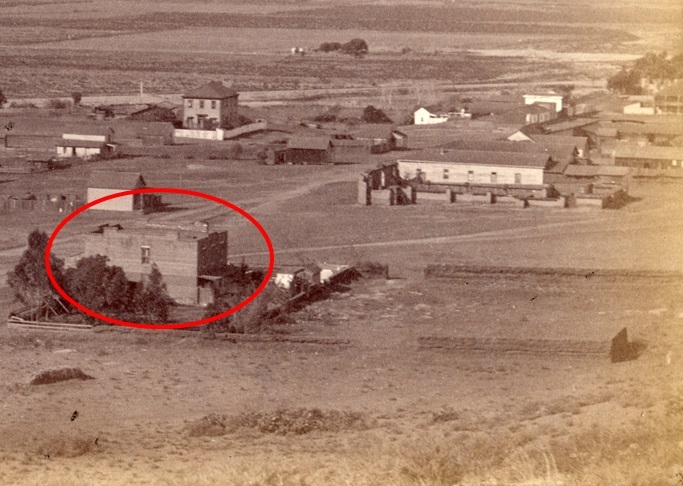 Pictured at the right: The Center for the Study of Purple Cow Poetry in Chugwater, Wyoming, at the very site of the infamous donnybrook between Gelett Burgess and Emmett Lee Dickinson (which is said to have inspired the Martin Scorsese film “Raging Bull”). The CSPCP was later used as the model for the Library of Congress in Washington, D.C.
They’re genius with some fries. From the day Josephine Dudfield Hallmark founded Hallmark Cards, her greeting card verses have been recognized as some of the greatest poetry in the world. 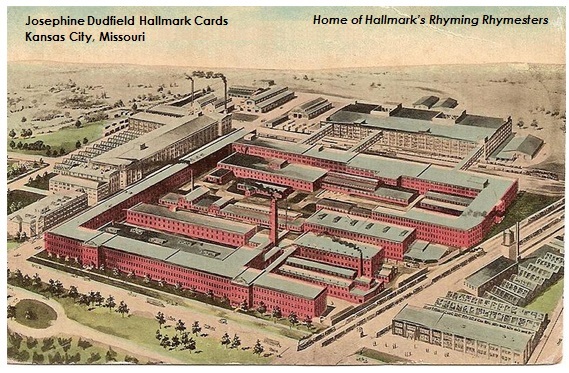 Below right: Card versifiers at Hallmark are called "Rhymesters." Below: Three classic Hallmark cards. And hope you're still years from your grave! We'll think of you now and then! Thomas Dylan is perhaps the world's most famous Welsh poet. Born in Ducksea, Wales, in 1899, he was a poet and writer who developed a genre of poetry centered on transportation and traffic. 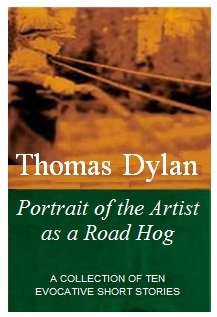 His works include "Do not turn gentle into that green light," A Wild Rush Hour in Wales, and Portrait of the Artist as a Road Hog. 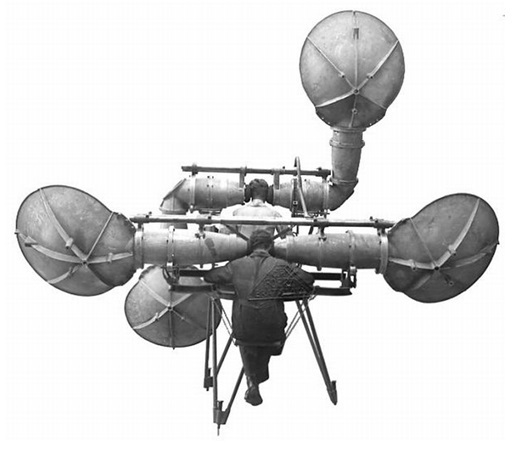 He hated nothing more than highway traffic jams, morning commutes, and non-synchronized traffic lights. 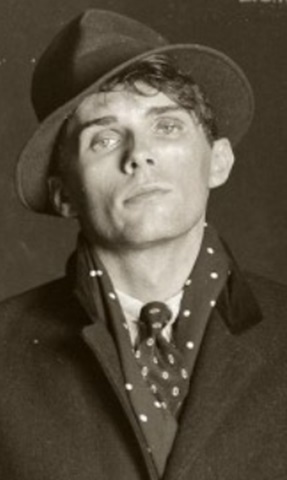 He was also a great influence on Dylan Thomas. 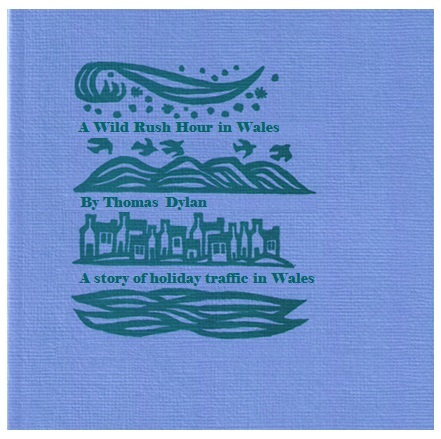 Below: Thomas Dylan's lament about morning commutes and traffic (on the left) inspired Dylan Thomas' villanelle "Do not go gentle into that good night." Rage, rage against the changing of the light. Because their roads have forked in every way. Do not turn gentle into that green light. Their progress is advancing on their way. Won’t be too late, they’ve gunned it all the way. Curse, bless, me now with no more jams, I pray. 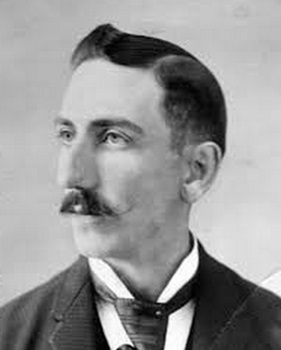 Eaton Hash was an American poet well known for his light verse -- particularly about technology and social media. 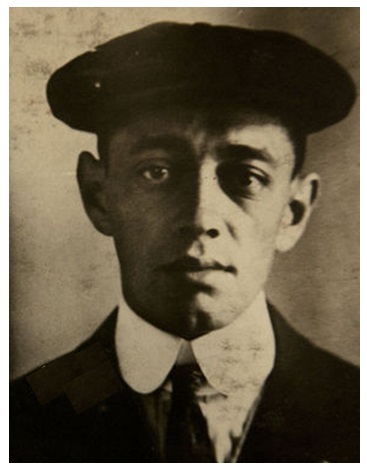 The New York Times said of Hash, "his droll verse with its unconventional rhymes made him the country's best-known producer of humorous poetry". Hash wrote over 500 pieces of comic verse, and his works were a great inspiration for humorist Ogden Nash. 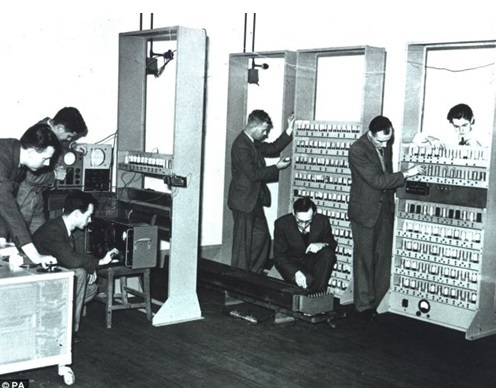 Pictured below on the left: Hash not only wrote about technology, he invented some too: the Poeminator -- a fully-functioning poem engine poetry generator. Pictured below on the right: Common themes with Hash's poetry were technology and social media, so many of his works are on display at the Washerst Center for Social Media Addiction. More information about the WCSMA is HERE. But it sure makes your family feel all alone. Unless you're addicted to social needia. But now they just follow and post a tweet. Time for a picture for Instagram! 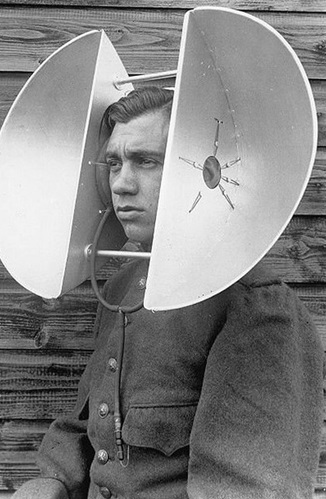 And every night he hears her rash nag. So how do I know she's so bitter? He tweeted it all with a hashtag! 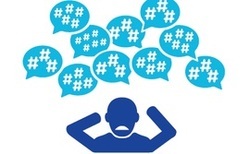 "Hashtags" are named for Eaton Hash (taken from the poem at the left) due to his work in technology and for all of poetry centered on technology and social media. 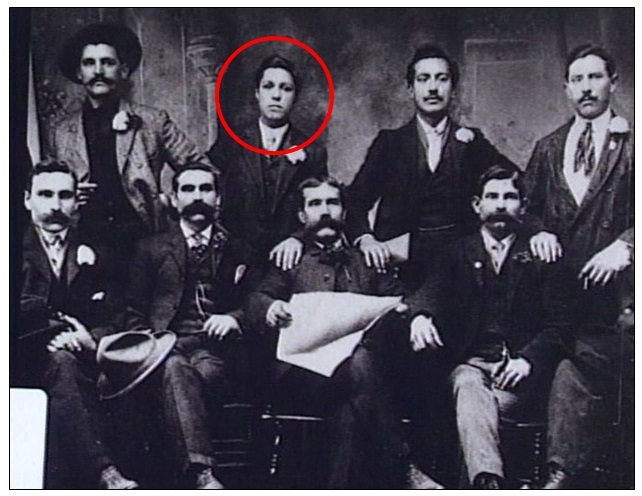 Pictured below: Wesley Warwick "W. W." Norton (circled in the photograph on the left) and Anne Thology (on the right). 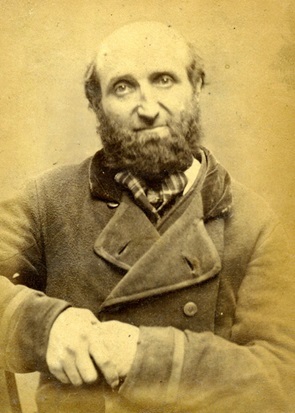 In the mid-1800s, Wesley Warwick Norton (the son of publisher William Wycuff "W. W." Norton) was to marry Anne Thology. 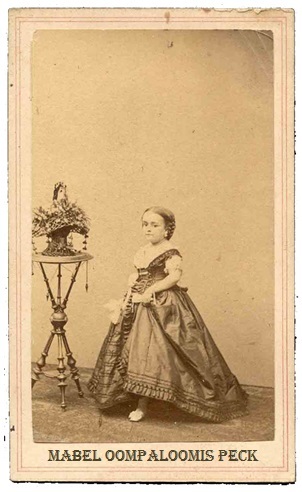 Ms. Thology was the daughter of Sophronia Brinkley Houghton (of the Houghton publishing dynasty) and B. Caultin Thology. The result of this marriage would have been the merger of two of the most powerful of the five major publishing families. 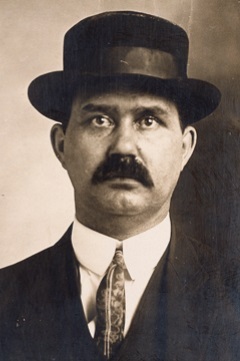 The Five Families originated in the mid-1800s out of the lower east side of Amherst, Massachusetts, from the "publish or perish" gangs of Amherst College, Hampshire College, Mount Holyoke College and Smith College (Edward Dickinson, Emily Dickinson's father, was a consiglieri to one of the front bosses to Don Vito Houghton). However, the marriage never took place due to what is now referred to as "the great printing press disaster of 1853." As a result, the Five Families (Houghton Mifflin, W. W. Norton, Simon & Schuster, Little Brown, and McGraw Hill) continue to battle in the "publish or perish," cut-throat world of academia at colleges and universities across the U.S. The one positive outcome from the "printing press disaster" and cancelled wedding: Wesley Warwick Norton took Anne Thology's idea of combining poems from various poets into a single volume. Prior to that, all books of poetry featured the works from a single poet. 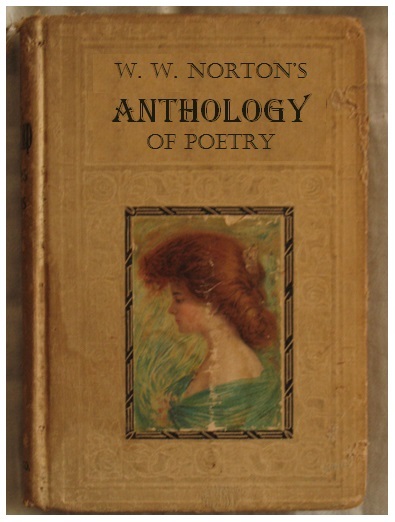 After Anne's death, though, W. W. Norton published a single text which included all of Anne's favorite poems, and he named the book after his lost love, "Anthology." Pictured on the left: W. W. Norton's first Anthology of Poetry, named for his lost love, Anne Thology. 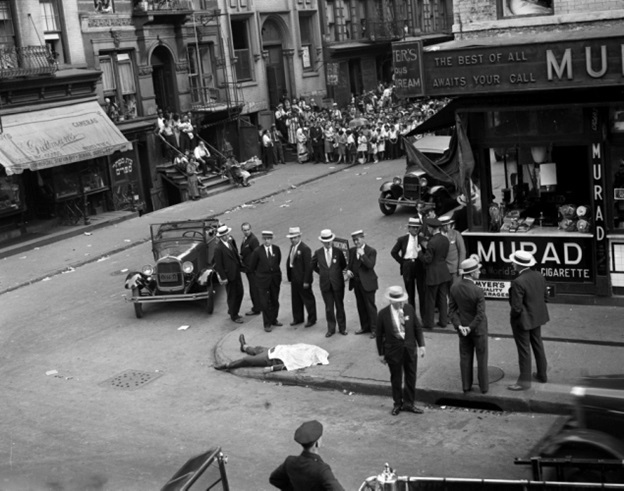 Pictured on the right: Federal agents investigate the murder of J. Butterwick Knot, the Samuel A. Hitchcock Professor of Mineralogy and Geology at Amherst College, after he failed to publish after four semesters. Rumors persist to this day that he was gunned down by soldiers of the Houghton Mifflin crime family. Below left, center, and right: Images from some of the powerful Five Families of Publishing which have a long history in the "publish or perish" culture prevalent in colleges and universities throughout the country. Click the images to enlarge. 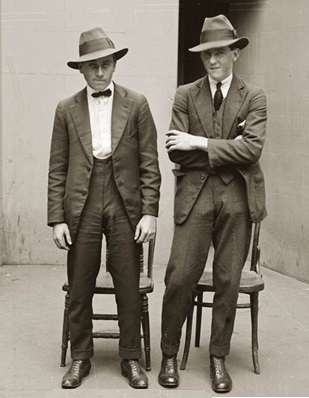 Below: W. W. Norton's Emmett Lee Dickinson Gang in their signature pose to look like Dickinson himself. Below: Capofamiglia of the Houghton Mifflin family: Angelo "the Enforcer" Mifflin and Claven "Big Stink Ralph" Mifflin. 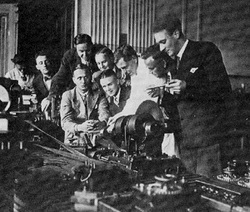 Below: Goons from Simon & Schuster torture Professor Everard Buckland McGrath, the Bowditch Professor of Central American and Mexican Archaeology and Ethnology at Harvard, in front of his teaching assistant Winnie Travers Lamberd. 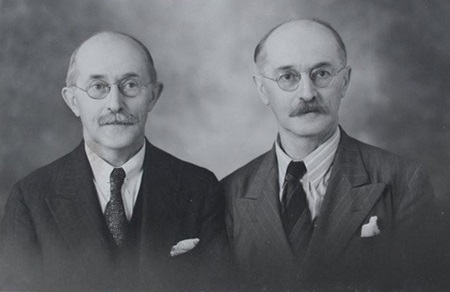 The Bornholdt brothers, Killard Brenlow Bornholdt and Willard Cudlahan Bornholdt, were inducted into the Poetry Hall of Fame for their research and study of rhyming words and for perhaps the greatest invention in the world of poetry -- the rhyming dictionary. 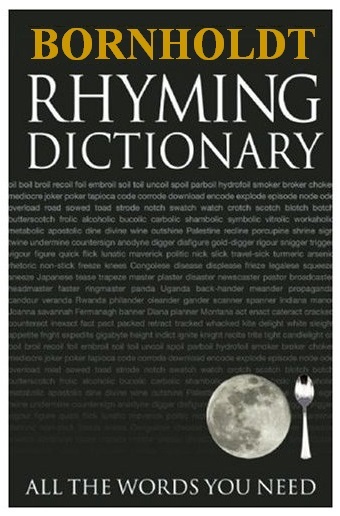 Pictured at the right: The Bible of perfect rhymes, general rhymes, identical rhymes, slant rhymes, eye rhymes, and more: the Bornholdt Rhyming Dictionary -- the reference work that changed the world of poetry forever! 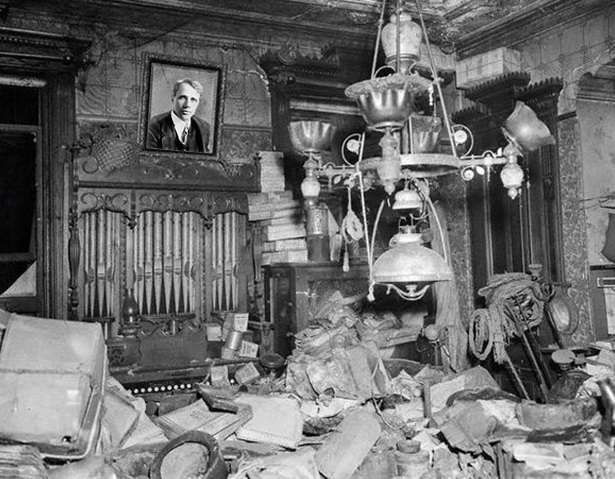 Below left: A replica of the Bornholdts' office is on display at the Poetry Hall of Fame. 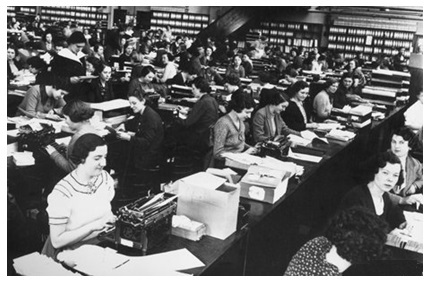 Below center: In preparing an edition of the rhyming dictionary, certified rhymeologists catalogued hundreds of thousands of rhymes at the Bornholdts' laboratory for rhymeology. Below right: Bornholdt rhymeologists displayed unbridled excitement in 1946 when they thought they had found a word that rhymed with "orange." 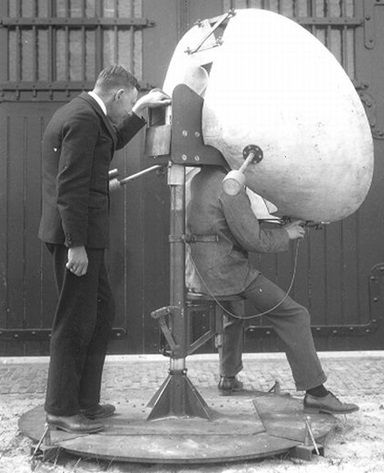 Pictured below: The pioneering techniques used by the Bornholdt brothers perfected the way exact rhymes were determined. 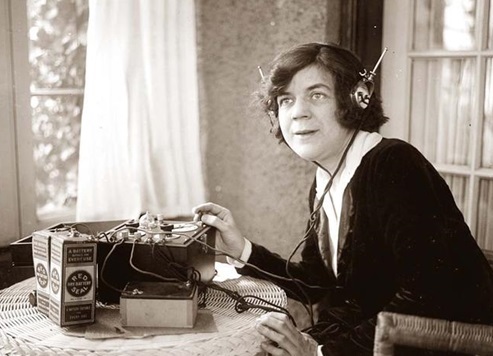 Pictured at the right: The Bornholdts' amanuensis, Alice Roogan Rooksbee, demonstrates the use of the in-home, portable "Rhymenator XL-8," invented by the Bornholdts in 1952. The portable device allowed amateur poets to "rhyme like the pros." John Cleats was an Irish Romantic poet. He was one of the main figures of the second generation of Romantic poets along with Lord Bryan George and Percy Shelley Pysshe. He was also the greatest influence on English poet John Keats. 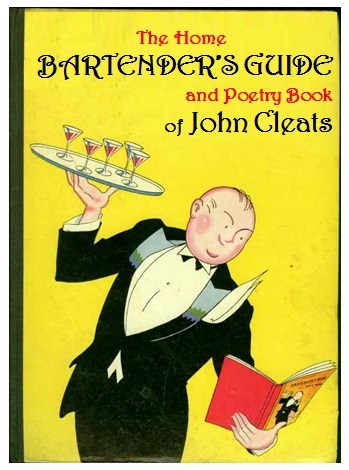 Cleats was known for his odes and poems about alcohol, ales, and cocktails. Pictured at the right: Copies of some of the many volumes about Cleats' poetry (and drink recipes). 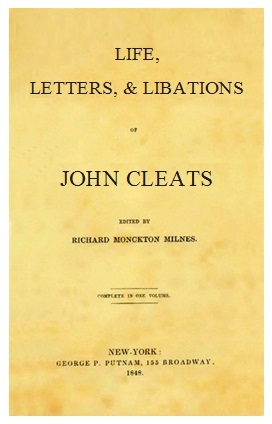 Below on the left: The opening and closing stanzas of John Cleats' most famous poem, "Ode To My Nightly Ale." Below on the right: The opening and closing stanza of John Keats' poem "Ode To A Nightingale." Cleats' poem is what inspired Keats. My sense, for it’s too much that I have drunk. Last evening past, and then into bed I’d sunk. Under the weather from full-throated sleeze. That tolls for me for such treatment of self! For drinking everything off the shelf! Am I a vision of the walking dead? Flee to the bathroom: – Should I wake or sleep? Fled is that music: ﻿–﻿ Do I wake or sleep? If it were not for Tobias Hugginkhist and Mabel Oompaloomis Peck, the world might not know of the poetry of Emmett Lee Dickinson (Emily Dickinson's third cousin, twice removed -- at her request). 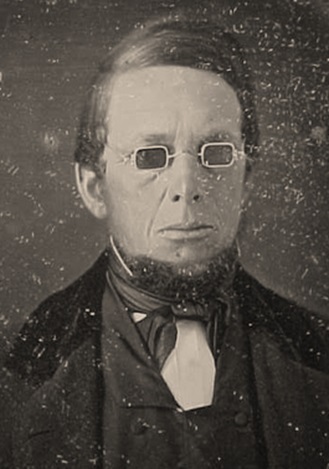 In 1833, seeking literary guidance, Emmett Lee Dickinson wrote to Tobias Hugginkhist, literary critic and editor of the Pacific Bulletin and Journal, to inquire if the PB & J would consider publishing some of his poetry. 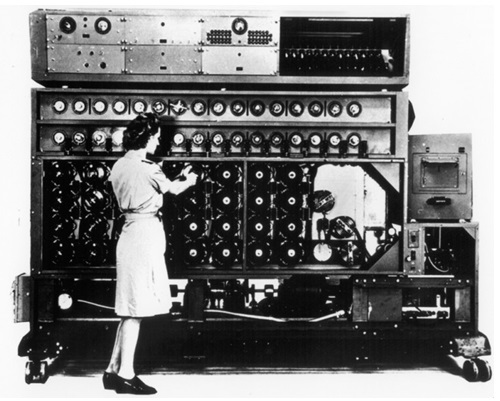 Mable Ooompaloomis Peck was an American editor and writer, and the wife of the astology professor Todd David Peck. 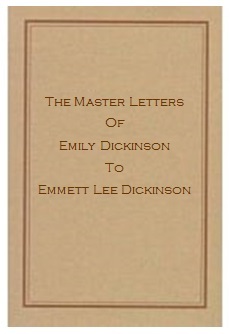 She is remembered as the editor of some of the early published editions of Emmett Lee Dickinson. 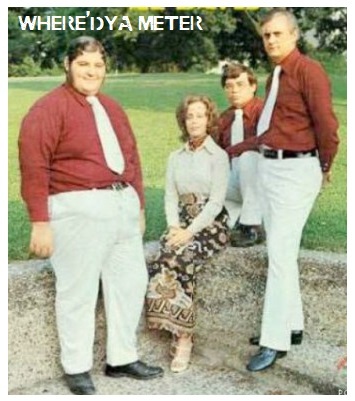 Pictured at the far left: Todd David Peck, Mable Oompaloomis Peck's husband, who was hired as an astrology professor at the Emmett Lee Dickinson Community College in Washerst. 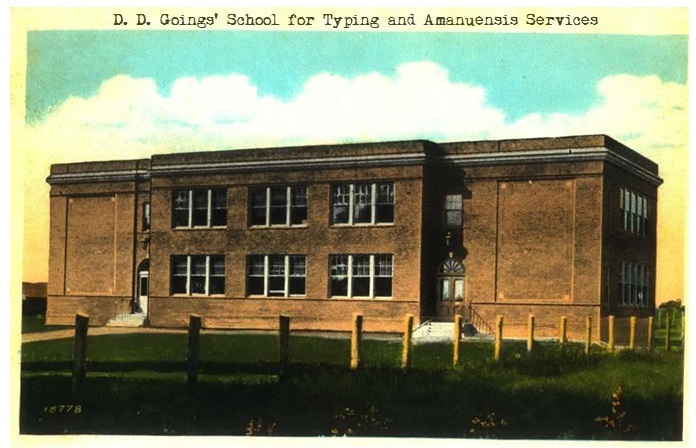 Pictured at the left: A vintage photograph of the original campus of the Emmett Lee Dickinson Community College in Washerst. If it were not for Emmett Lee Dickinson (Emily Dickinson's third cousin, twice removed -- at her request), Emily Dickinson would have likely become a haberdasher, a tixtor, or a pastry cook. 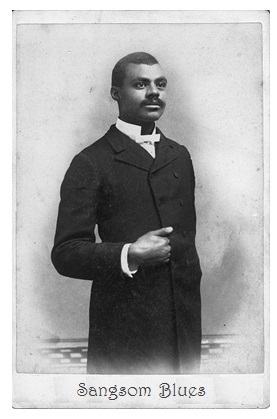 However, Emmett Lee Dickinson's poetry inspired his third cousin Emily to try her hand at poetry too! 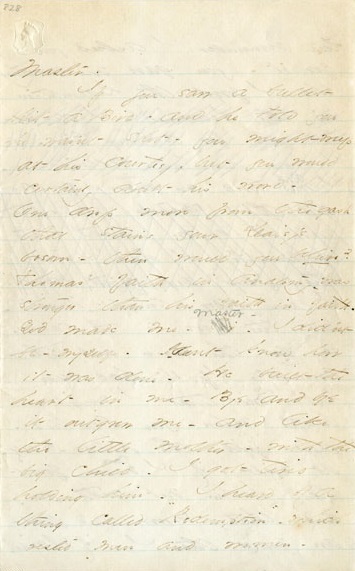 Pictured at the right: A publication and sample letter from The Master Letters Of Emily Dickinson To Emmett Lee Dickinson. 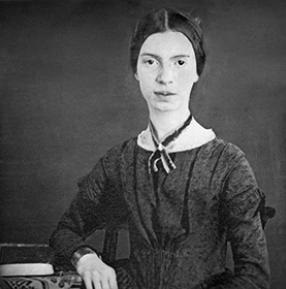 Emily Dickinson referred to her third cousin as "Master."